Has National changed its policy on the super-city? Yesterday I pointed out that the Local Government Act requires referenda on boundary changes such as are envisaged for Auckland. To not do so would be to use the parliamentary rights to amend legislation to remove a required consultation with the citizens of Auckland. It appears likely (from Graeme) that NACT will put forward a new bill to enable the changes, thereby by-passing the Local Government Act. Support the Royal Commission providing an opportunity for people within the Auckland region to express their views about the structures that will best achieve the goals set out above. Consult with Aucklanders once the findings of the Royal Commission are known. sure each community in our biggest city feels appropriately represented. I’ve emphasised in italics the interesting bits. It appears that their coalition partner Act, in their haste to get the super-city implemented before 2010, is going to prevent any significant ‘consultation’. The Local Government Act sets the standard of a referendum as appropiate consultation. It is difficult to see how National can consult with Aucklanders if they don’t get Rodney to leave time for a referendum. Moveover, it is hard to see how local boards are going to be able appropiately represent communities. They may get people on those boards, but Rodney Hide is proposing that the boards are effectively powerless to change the use of resources without the super-city council’s approval. People elected to those boards will be able to ‘input’ but be unable to change anything. Of course the National Party would probably argue that communities can band together to secure one of the eight at-large seats, as John Key has suggested that Maori do. The problem with that is the level of resources that will be required to run a city-wide campaign and the clear effect that such a campaign will favour groups with a lot of money – leading to excessive venal politics. Hardly likely to favour local communities or even the wider ones apart from the business interests who support both Act and National. So the question is, are National covertly changing their policy to one of non-consultation and inadequete community representation to keep one coalition partner happy? They certainly didn’t keep the Maori Party happy. What actual power will community boards have? Cake Stalls and Dog Licenses? Why would anyone bother voting for candidates with no actual power of local body resources. On another note it seems privatizing the airforce/ army bases are back on the table too.. Maybe start with privatizing the Skyhawks or is the US still blocking any private sale? Like a cheap imported onion, layer after layer is being peeled back from the National Party to eventually expose its rotten core. Which, I guess, falls in line with the ideology of those on the right where those with the most, get to call the shots. There is also an argument that the Government changes to the Royal Commission’s report conflict with the terms of reference that the Royal Commission operated under. The Royal Commission’s terms of reference required it to come up with a solution that was “consistent with the purposes and principles of local government as described in the Local Government Act 2002”. Under section 14 when making a decision a Local Authority must make itself aware of, and should have regard to, the views of all of its communities, and it should take account of the diversity of the community, and the community’s interests, within its district or region. A local authority should also provide opportunities for Maori to contribute to its decision-making processes. Arguably the Nats are in breach of most if not all of these requirements. 1. The current National government is not a Royal Commission. 2. The current National government is not a local authority. The obligations on local authorities that you list will all apply to whatever final form the new Auckland council takes. If it doesn’t “have regard to, the views of all of its communities, and it should take account of the diversity of the community, and the community’s interests, within its district or region. A local authority should also provide opportunities for Maori to contribute to its decision-making processes.” then its decisions will be open to challenge whenever it makes them. 2. If the National Government accept that their amended proposal is based on a less democratic and representative model than the model the Royal Commission was asked to come up with. Legally you are right. The provisions of the LGA are not biding on Key and Co. If there is an expectation however that they should live up to what are good principles then they have failed. I should not have said “requirements”, I should have said “legitimate expectations”. However the NACT government still has to justify its decision not to have a referendum to the voters, it is the standard practice. So why do they wish to ignore that – perhaps the reasons would be embarassing? To have a bloody Rugby World Cup? To allow John Banks to have V8 racing in the streets? Graeme is spot on. None of this really matters. “The Government’s decisions on Auckland governance – “Making Auckland Greater” – are bold, decisive, and overall radical. Nick this was Kenneth Palmer. They bring Kenny out occasionally to support various conservative views. He is the sort of guy who still wears roman sandals and socks. Janet Clews’ comments, also in today’s Herald were far more astute. To paraphrase she thinks that the changes are a load of croc. She has been in Local Government for decades and she is not standing again. But she despairs because local people are going to lose quality representation. The voice of the communities will still be heard through the local board structures and ward members, striking an appropriate balance between unified representation and local democracy. In other words the boards are powerless to be anything more than a institutional lobby group, without significant funding or any way to raise it. They are ineffectual – perhaps he could explain why he thinks this is a good idea?. Did you also notice that he’d said that the government threw away all of the ideas from the Royal Commission? Although innovative in promoting the Super City concept, the report’s overall thrust was incremental, basically retaining the existing territorial governance level. The Government’s decision on Auckland Governance provide a far more radical blueprint. I see that he doesn’t like the idea of a referendum. Of course he doesn’t deign to say exactly why. He contented that the reform was in line with the Local Government Act, but doesn’t explain why he’d prefer that the referendum provision that is such a key part of it is ignored. That’s unbridled power for you. Now you know how the Electoral Finance Bill felt. I believe it’s called a Select Committee. 1) The process under which the EFB was run was a farce. Witnesses at select committee (which was ineptly chaired) were told to ‘go and join the exclusive bretheran’. The Human Rights Commission were nearly prevented from appearing, and when they did appear their submission was completely ignored, as was the submission of the Law Society. Labour rammed in last minute ammendments at multiple stages of the bills processes, sometimes in their hundreds. The implications on the Bill of Rights were completely ignored. In addition Labour simply didnt know what it was doing. Mark Burton was sacked as Minister of Justice half way through the Bills process because he had no idea what he was doing. The Super City process has so far been relativly good. The Select Committee as Peter points out is working and Public Submissions are being heard. We will have to wait and see which recommendations are adopted, so too early to judge on that one. 2) The EFB was not only undemocratic in process it was poorly written and undemocratic in nature. The head of the electoral commission couldnt even understand and interprete the Bill, which is quite funny given that it war her job to. The contents of the Bill essentially limited the ability of 3rd parties to participate in the election campaign, although i wont go into that, its well known. The super city does no such thing. People still get to vote for their councilers, its just that local government is smaller. And while is unclear what the purpose of the community boards will be at the moment they seem to be a way to provide representation. 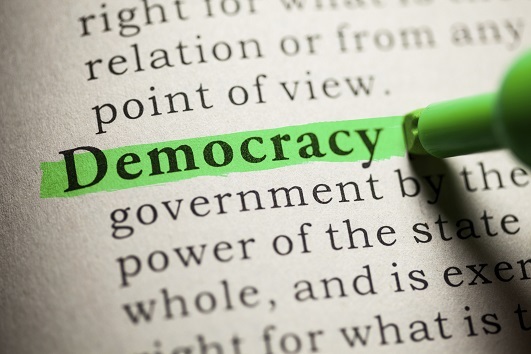 The democracy under attack banner is largely aimed at the NZ Herald who used it as a logo on the anti-EFA stuff. They haven’t so far bothered to do more on the super-city than a few limp editorials – despite it being a radical change to the local politics in their city. It is a change that had a process through the royal commission. Whose findings were almost entirely dumped by Rodney Hide – they left the Mayor and the single rating system. The Super City process has so far been relativly good. The Select Committee as Peter points out is working.. The select committee hasn’t even started, we haven’t seen a bill yet. And you think that it is good. You must be either an idiot or someone who doesn’t understand much about parliamentary or electoral processes. That probably explains your ideas on the EFA process. Besides the standard for changes in governance boundaries and voting systems is referendum. It was what brought in MMP. It has been used in every local government change since 1990 (and some before). Act and National need to justify why they feel the need to override the usual democratic process of a referendum for one that involves Rodney making up ideas on the fly (2 weeks) without consultation and then pushing it through parliament. As you point out, the select committee process can be flawed, which is why referendum are the preferred authorizing process for this type of change. Perhaps you should study up on the legl process of government a bit. Comments like the one above just make you look like a fool. It has been used in every local government change since 1990 (and some before). Exactly. That isn’t all that long ago. And the massive change that happened without referenda before then belies any argument that it is the natural process. · the number of ad hoc or special purpose bodies was reduced from over 400 to seven. A major rationale behind the statutorily-provided referendum process is that these are (proposed) amalgamations that avoid parliamentary and select committee scrutiny. They don’t have Royal Commissions, and they don’t really have much government involvement at all. etc. We had a referendum on a retirement savings scheme in 1997, where was the outcry about the lack of democracy when the Cullen Fund and Kiwisaver were started? We used to have lots of referenda about liquor licensing. The abolition of the six o’clock swill happened following a referendum, why didn’t the drinking age get a referendum? It was argued that a select committee process was enough for major constitutional change such as the creation of the Supreme Court, and major change in the lives of New Zealanders, such as the amendment of section 59 … why isn’t it enough here? Now I think there there should be a referendum, but to argue that this is anomalous just isn’t accurate. There weren’t referendums following the last re-organisation of local government – and there were mergers and dissolutions all over the country. The normal process is a referendum. You should be ashamed of yourself, Graeme, as someone who supposedly stands for open government, for trying to make excuses for not having a referendum. You say you would support a referendum but you speak against it at every oppportunity. The question should not be ‘why have a referendum?’ it should be ‘why not?’ Sure, in a total national reorganisation of all local government, it is understandable that you wouldn’t have 700+ referendums but this is just a merger and you’ve provided no reason why Aucklanders shouldn’t get a referendum like the people of Banks Peninsula, Christchurch Napier, and Hastings had. Face it Graeme, you’re just trying to make excuses for the Nats and ACT. You’re not standing up for democracy when you have the chance. I support there being a referendum. I am not speaking against a referendum at every opportunity. I am speaking against many of the arguments that have been advanced as to why there should be a referendum. The arguments aren’t very good. I am speaking against some arguments that seem ignorant of history, etc. A good argument goes like this: this a major change in the democratic structures that govern the live of Aucklanders. They should have the final say over what democratic structures govern their lives and their city. A referendum is a must. Arguments that the government is violating the terms of the Royal Commission, or is going against a process that is set up to occur in situations where there is no parliamentary input, and the reorganisation is proposed by a petition of residents do not add to this, they detract. Agreed Malcolm. Comparing this to the liberalisation of drinking laws, when there’s a specific Act that calls for a referendum in this very situation that NACT are consciously bypassing is a pretty weak comparison – weasel words. Unless there was an Act that calls for a referendum on drinking laws that the recent changes deliberately bypassed, it would appear you’re being an apologist for NACT, Graeme, despite protestations to the contrary. So the situation is different because there is parliamentary involvement. But this detracts from the argument for a referendum? If you’re taking a very narrow viewpoint, then I could see why you’d make that argument, but fail to see why you think it would apply to the real world. If every newspaper ran with this, saying that there is legislation that calls for a referendum, in certain circumstances, you can bet John Key would be on Breakfast at 7:54 am on Friday saying that “we’ll look into it, it’s definitely something we’re considreing, I can’t rule it out”. Sure, Bill English or someone else might say that he’s wrong two weeks later, but as far as detracting from calls for a referendum – nope. That’s the problem. There isn’t a legal reason. There is a moral and democratic reason. So explaining that there is a legal reason, in some circumstances, detracts from calls for a referendum by…? Ain’t nothing wrong with saying “hey, in some circumstances there needs to be a referendum – surely there should be one here too”.